The classic Mediterranean dip is given some extra pizzazz with loads of curry and pumpkin flavor. 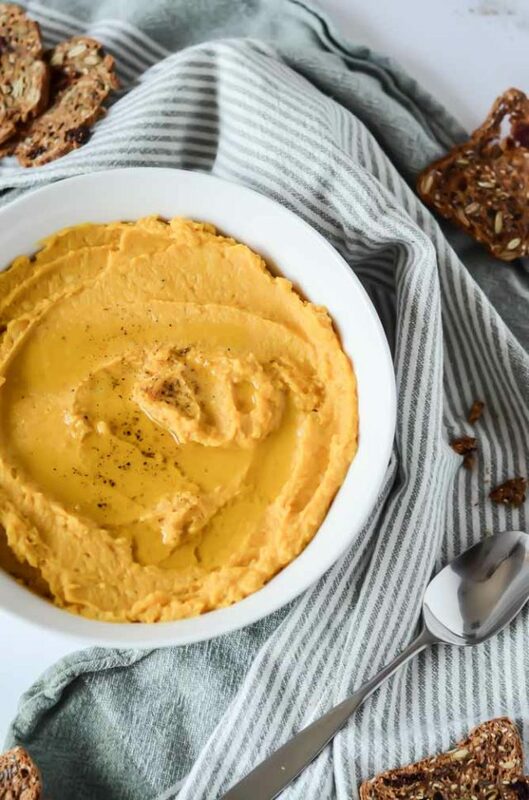 This 5-Minute Pumpkin Curry Hummus should most definitely be on the menu for your next dinner party! Since tomorrow is officially the first day of fall, I’m jumping on the pumpkin bandwagon and I couldn’t be more excited about it. It has just been so ridiculously hot here that you don’t want to even fathom turning on the oven or any other sort of indoor cooking heat source. Our typical weeknight dinners have become lots of salad plus any protein we can throw on the grill. 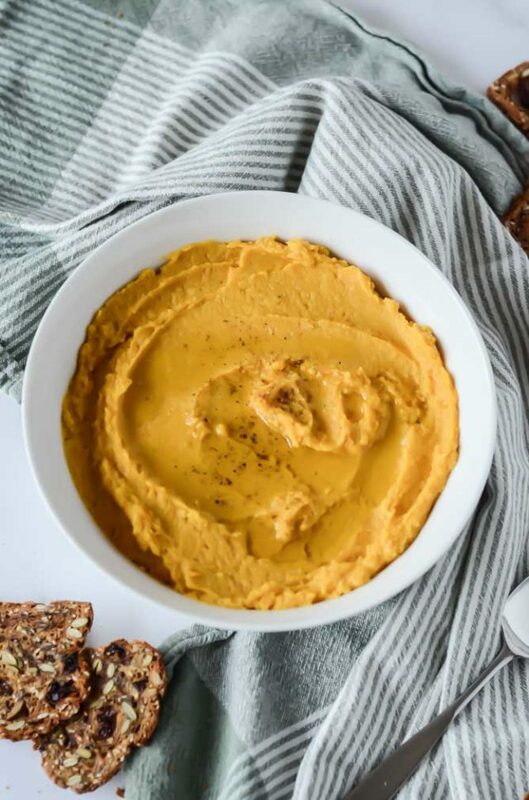 I’ve had a go-to pumpkin hummus recipe for a couple of years now and it is a surefire hit wherever I bring it. 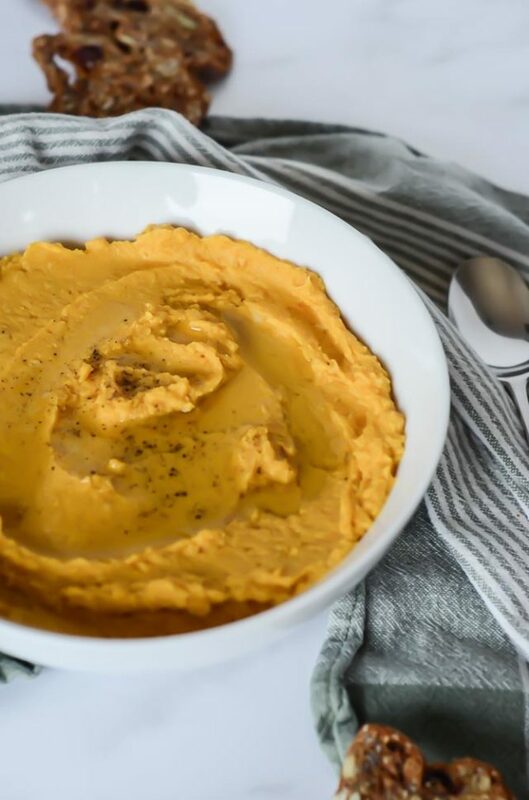 So I got to thinking of how I could expand on it (while going through the items that I already had on hand in my pantry/kitchen) and this Pumpkin Curry Hummus was born. I tasted it while it was still room temp and hadn’t marinated in the refrigerator for any time, and I definitely thought it had potential, but it wasn’t until I brought it over to a friends’ house and they started going at it with a bag of chips that I realized I had a winner. I’m so glad I wrote the recipe down! Thinking about it more, this is a great way for those of us living in less extreme climates (read: still sweating our you-know-whats off) to get into the fall spirit. The comforting flavors of the curry lend a subtle spice to the sweetness of the pumpkin and, one added bonus, it’s healthy! Yes, feel free to go at this with your crudités folks. Who doesn’t love a hot weather fall comfort food? This post contains affiliate links. As always, all thoughts and opinions are my own. As always, thank you for supporting the brands that make CaliGirl Cooking possible! 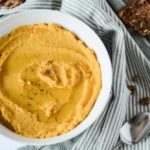 The classic Mediterranean dip is given some extra pizzazz with loads of curry and pumpkin flavor. Add all ingredients except olive oil, salt and pepper to a food processor and pulse until mostly combined. Turn the food processor on and slowly pour in the olive oil until it's reached the desired consistency. Season with salt and pepper and enjoy!